Narenjestan or Qavam Garden of Shiraz dates back to Qajar era and is located on the eastern side of the end of Lotfali Khan Zand Avenue. 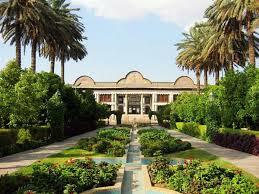 Due to abundance of sour orange trees it is called Narenjestan. Narenjestan building has been a place where ordinary people went for administrative purposes and public meetings as well as meetings among Qajar dignitaries and nobles were held there. Front facade of building with painting of ―Lion and Sun‖ (the Qajar royal emblem) on the pediment. Qavam House (also widely called ―Narenjestan e Ghavam‖) is a traditional and historical house in Shiraz, Iran. It is at walking distance from the Khan Madrassa. Qavam House was built between 1879 and 1886by Mirza Ibrahim Khan. The Qavam family were merchants originally from Qazvin. But they soon became active in the government during the Zand dynasty, followed by the Qajar, and Pahlavi dynasty as well. The Qavam ―Naranjestan‖ preserves the elegance and refinement enjoyed by the upper-class families during the 19th century. The paintings on the low ceilings of the house are inspired by Victorian era Europe. The mirrored porch was a focal point of the house, overlooking a small garden that was designed with fountains, date palms, and flowering plants. During the second Pahlavi era, the House became the headquarters of Pahlavi University‘s ―Asia Institute‖, directed by Arthur Upham Pope and Richard Nelson Frye. Frye and his family also lived in the house for a while. The house today is a museum and is opened to the public.